Edgewood is a neighborhood in Northeast Washington, D.C., USA. 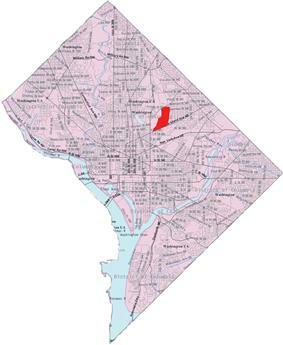 Edgewood is bounded by Lincoln Road and Glenwood Cemetery to the west; the tracks for the Red Line of the Washington Metro to the east; Rhode Island Avenue NE to the south; and the combination of Irving Street, Michigan Avenue, and Monroe Street to the north. Edgewood is in Ward 5. The neighborhood, outside the original boundaries of Washington City, was originally part a 30-acre (120,000 m2) farmland estate called Metropolis View, part of Washington County. In 1863, Salmon P. Chase, then U.S. Treasury Secretary under Abraham Lincoln, purchased the estate and attenuated another 20 acres (81,000 m2) of land nearby, built a mansion, and renamed the newly expanded estate Edgewood. The mansion itself was at what is now the corner of Edgewood and Fourth Streets NE. When Chase died in 1873, his daughter, Kate Chase Sprague, moved onto the crumbling estate and lived a reclusive life with her intellectually disabled daughter, farming pigs until she died in poverty in 1899. In the 20th century, the house belonged to the St. Vincent's Orphanage Asylum and Catholic School, the largest orphanage for girls and a coed school. The city, however, gained possession of the remainder of the estate and around 1950 began developing it as an urban neighborhood. Edgewood Terrace, a large complex of mixed-income and senior-citizen public housing, began development in 1970 at the hands of Bethesda, Maryland developer Eugene Ford. Today, Edgewood Terrace remains a central landmark of the Edgewood neighborhood, enough so that the neighborhood itself is sometimes called Edgewood Terrace. Edgewood is served by the Metropolitan Branch Trail.